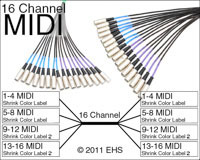 This is our custom-built MIDI top quality 16 channel Mogami snake cable. You won't find a nicer snake anywhere. Construction is Rean MIDI connectors with Mogami 2934 cable, fan-out wires with braided sleeve for protection, connectors with shrink tubing for color code and strain relief, and number labeled. Rean connectors are some of the best connectors around. Mogami wire is the best wire, used in the best studios for its ultimate sound qualities and durability. This cable carries just the MIDI signal, the Syncro pins 2 and 3 are not connected which are not often used anyways. Mogami 2934 cable is very flexible, durable, heavy-weight cable. Select fanout length: Normal length is approximately 13 inch. If you need different options, please contact us. Photo 1 shows the two ends with blue and violet shrink color labels and visual wiring layout. Photo 2 shows expanded view of the two ends with blue and violet shrink color labels and green master.